China Mobile is a Chinese Telecom major that has been in the news in recent years because of its jaw dropping growth rates as well as its ballooning subscriber base. Once considered as a protected state owned enterprise incapable of efficiency, it has now transformed itself into a domineering company in China with global dreams and ambitions to conquer international markets. 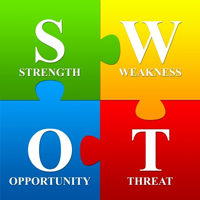 As the succeeding SWOT Analysis indicates, the company can leverage on its strengths and work on its weaknesses so that the threats are transformed into opportunities and it continues to be a company to reckon with. Over the last few decades, China has transformed itself into an economic powerhouse and this is the key strength of China Mobile that was unheard of in Western capitals and for western investors until a decade ago. Indeed, the fact that China Mobile was ranked in the Top 100 Important Brands in the World in 2007 means that it has well and truly arrived in the global arena. The company boasts of an incredible number of customers (estimated to be nearly half a Billion) which is a key strength though it must be mentioned that since it is a state owned enterprise and operates in a monopolistic market, these figures are partly due to its domineering presence in the country. China mobile is growing at a scorching pace nearing 50% annually which means that in a few years time, it would be way ahead of the global competition by any yardstick. Finally, the company has embarked on an international expansion to increase its global footprint and it has been on a merger and acquisition spree especially in Africa, which is touted to be the next emerging frontier. A key weakness of China mobile is that it is not yet ahead of the technology curve though it has the numbers and the volumes to justify its leadership position. This is partly due to the problems that it had in shifting from CDMA to GSM protocol because of the legacy handsets and associated problems and hence, the company was unable to make the transition to the 3G network in a seamless manner. Another weakness is that China mobile so far has restricted itself largely to the domestic market. Though we had mentioned about its international expansion, the fact that it is yet to tap into the developed west signals a hesitation and a lack of confidence in taking on global biggies in their backyards. Even for the expansion into Africa, China mobile is relying heavily on its partnerships with local players, which means that it is yet to develop an international identity of its own. As China continues to grow at a scorching pace, the company can expect a huge jump in its subscriber base though the overheated domestic market might compel it to look outwards for its expansion in the years to come. However, this does not detract from the fact that China mobile is poised to tap into the growing domestic market albeit in a restrained manner unlike the previous years where it was uber aggressive in its strategies. As with many other SOEs or State Owned Enterprises in China, the company has recorded annualized profit growth rates in excess of 20%, which has made western investors, look at it with excitement as such profit rates are unheard of in the developed west. It can convert its weakness of being unable to transition to 3G technology into an opportunity by tapping into the rural market in China which is still to be explored meaning that China Mobile can start afresh without any legacy issues troubling it. Moreover, as the cities become saturated, it is only natural that China Mobile starts to look to the rural hinterland for future growth. The Chinese telecom sector is still heavily regulated and screened off from international competition, which is a threat as the Chinese government in recent years has been contemplating opening up of the sector to foreign firms. Further, China Mobile also needs to be wary of competition from local firms and domestic players as the industry opens up in the future. Another key threat to China Mobiles profitability is that until now it has been playing the numbers game wherein it added subscribers mostly in the low price, low value segment, which means that it is a volumes player rather than a premium player. With recent technological breakthroughs like 4G and even 3G, China Mobile faces a threat to its business model and it has to offer higher value added services to stay in the reckoning. Its cozy relationship with the Chinese Government is partly because it is a SOE and this might change in the future with the gradual opening up of the economy wherein the government would most likely asses the tradeoff between social dividends and economic payoffs. As the preceding SWOT Analysis indicates, China Mobile has its task cut out as it begins its international journey and continues its domestic market leadership. As things stand, many western investors are eyeing its stock which is clearly an achievement considering that its IPO (Initial Public Offering) in 1997 hardly attracted interest outside Hong Kong where it started its evolution from a limited player to a market leadership position.